In humanity's war against The Covenant, brave soldiers standing side by side with powerful super-warriors battle against impossible odds. For the truly impossible jobs, though, that's when the Master Chief goes in to work his magic. 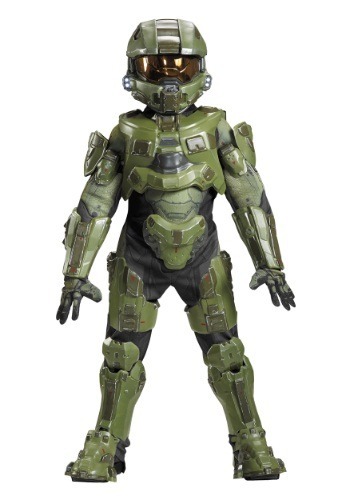 If your little trooper wants to get into the action himself, this Master Chief Ultra Prestige Costume is as close to looking like the famous SPARTAN as it gets! Master Chief is a man of few words, preferring to let his actions do the talking for him. Which is good, because SPARTANs don't get paid to negotiate and make pretty speeches! There's something special about Master Chief, though. Some say it's luck, while others say it might be the chatty A.I. downloaded into his armor that gives him an edge. The Covenant troops that fight against him even believe he's an evil demon. We're sure Chief is perfectly fine with them thinking that when they meet him on the battlefield. 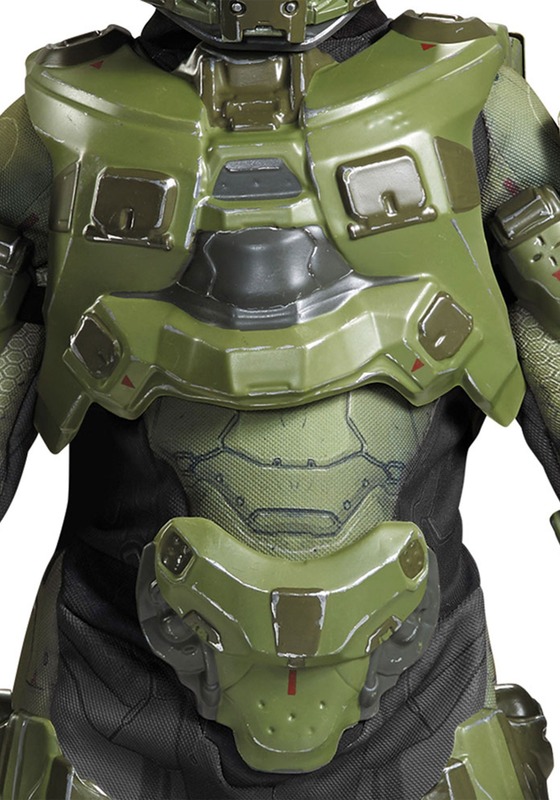 Now, nothing would be more awesome than a real suit of the Chief's armor, but that would weigh hundreds of pounds, and we bet you wouldn't be allowed to wear it in public because you'd keep knocking holes in the walls and smashing doors down. 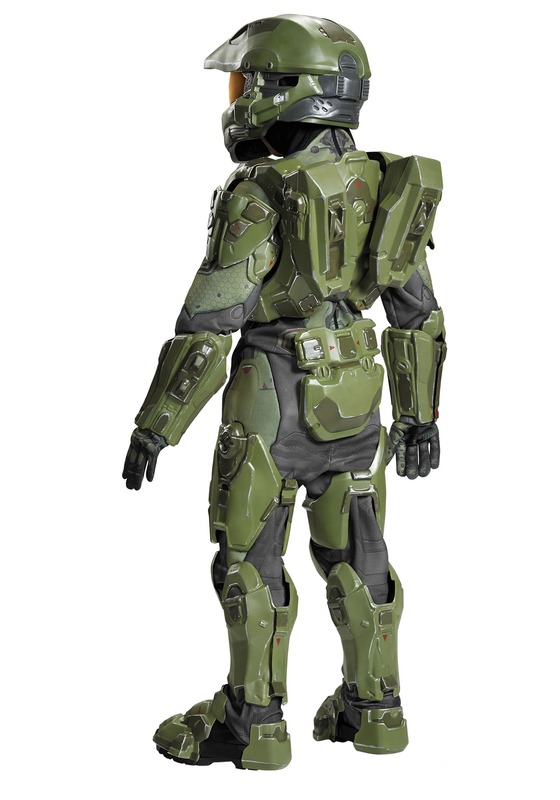 This full body costume captures, in Ultra Prestige detail, the look of the famous "Mjolnir" power armor worn by the Master Chief in the Halo video game series. It includes a full-head helmet, and molded plastic armor pieces that fit over and attach to the printed bodysuit. It's the best outfit you can equip your little commando with for any assignment, whether it's a high risk space operation, or a top secret candy recon and recovery mission! My 10 yr. old son loves Halo. I was going to try and make a Master Chief costume for him this year but when I saw this I couldn't resist. It's better and probably cheaper than I could have made it. It's a little big on him but that's okay, he'll be able to wear it again next year (and probably every day in between) which makes forking out that kind off cash for a costume a little easier to swallow. The plastic armour pieces are made of a fairly sturdy plastic, so they are not going to break easily, certainly not just wearing it around anyway. The order arrived in 3 or 4 days. I couldn't believe it. The only negative I have is the helmet lights. You have to hold the button for them to stay on. You let go of the button, the lights go off. It would have been nice if you could turn the lights on and they would stay on. Also, just fair warning. The helmet is not easy to see through at night. 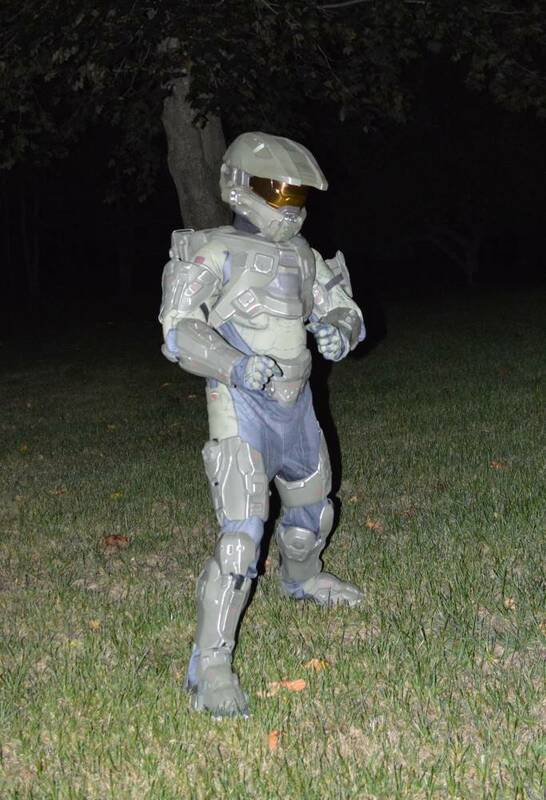 Unless you're trick or treating in a well lit area, you're little spartan may have trouble seeing. An amendment to my first review. The lights in fact do stay on. There's is a little tab inside the helmet that has to be removed. I didn't see that at first.